Researchers from the University of Malta’s Conservation Biology Research Group, led by Dr Adriana Vella, have for many years been collaborating with fishing clubs to monitor the types and number of fish being caught during their shore fishing competitions, to contribute to effective management of recreational sport fishing. Such competitions are held regularly all year round along the Maltese coast, with the total catches amounting to just 0.06 per cent of the official annual commercial catch of the species concerned. The most frequently caught fish in the competitions are the Mediterranean rainbow wrasse, the annular bream and the two-banded seabream. 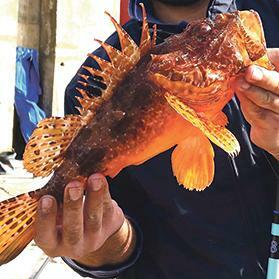 Various alien fish species in Maltese waters are also caught, including the Cocoa damselfish, the Dory snapper, the Indopacific Sergeant and the Niger hind. One of the researchers, Sandra Agius Darmanin, has been monitoring this type of fishing for the past six years as part of her doctoral research, assessing and identifying catches, fishing methods and evaluating the effectiveness of the ‘catch and release’ practice. This practice, which is endorsed by all clubs, involves keeping the fish alive in keep nets and releasing them at the end of competitions. Agius Darmanin says she has seen an effort by all clubs, especially by the National Federation of Sport Anglers Malta, to reduce fish mortality during the competitions in the past two years and results indicate that the efforts are proving effective. The results of this research have been presented at various international conferences, including the CIESM Congress in Kiel and the ICES conference in Riga, as well as published in the Journal of Fisheries Management and Ecology. This filling of a long pending gap in knowledge linked to recreational fishing is appreciated at local and European level. The diversity of local coastal species is already affected by various anthropogenic activities, disturbances, pollution and climate change influences on the marine environment. Dr Vella said such collaboration between researchers on the conservation of marine biodiversity and other stakeholders in the sector is the way forward to ensure effective sustainable management of this growing sport.